Final Fantasy XV Online Co-Op Confirmed | Nerd Much? Paris Games Week just dropped a bomb that we weren’t expecting, as Square Enix has announced that DLC for Final Fantasy 15 will bring online multiplayer. In fact, co-op multiplayer DLC will become available shortly after the game’s launch in November. The mode will be included with the Final Fantasy XV season pass as one of the six DLC packs coming. 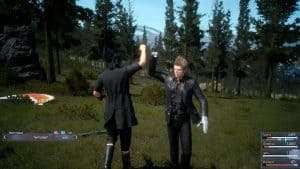 We don’t have much along the lines of details about the Final Fantasy XV online co-op DLC, but we know that it will allow up to four players to battle together as Gladio, Ignis, Prompto, or Noctis. Square also announced some of the details for three of the other DLC packs, which will allow players to jump in as those three characters in single player. Of course, this is the first time that Final Fantasy has ever received any co-op online play, and although we don’t have many details just yet, it’s going to be exciting seeing how it all will work, and we’re ready to throw our money at Square to play with our friends online. Also while at the Paris Games Week conference, Square Enix unveiled an incredible new cgi Final Fantasy 15 trailer titled “Omen”, which we’ve embedded below. For more of the latest gaming news, stay tuned to Nerdmuch.com. You can also follow us on Twitter for the latest.